Alkimos Baptist College is a private, co-educational school, established in 2011 in the northern coastal region of Perth, Western Australia. 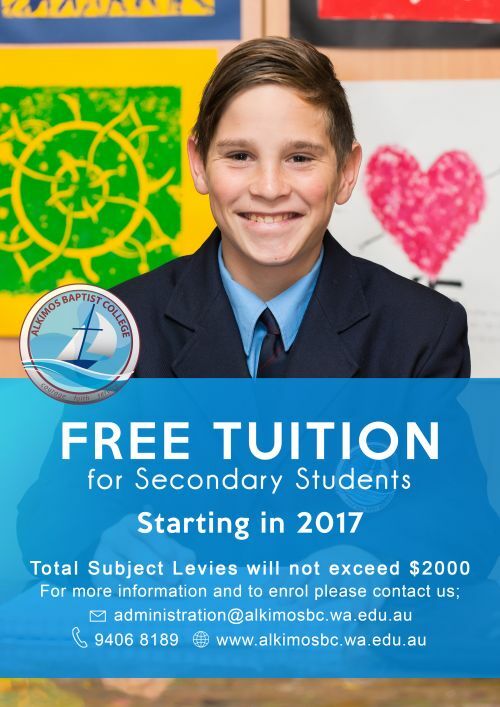 In 2019, the College will provide quality academic programs within a Christian ethos, for children in Kindergarten to Year 12. Alkimos Baptist College is associated with the Baptist Family of Churches and Schools in Western Australia. The College is seeking a committed Christian to fill the following staffing position in 2019. Alkimos Baptist College is fully committed to the protection of children. Successful applicants must satisfy child protection screening and adhere to the College's child protection policy and Staff Code of Conduct. The selection of staff at Alkimos Baptist College is of prime importance due to the particular nature of the College. Alkimos Baptist College is a Christian school and part of the network of Baptist Schools and Colleges. All staff at Alkimos Baptist College fullfil the school's commitment to promoting and safeguarding the welfare, wellbeing and safety of children. The College is compliant with relevant child safe legislations and that all staff are required to hold a creent WWCC. Fill out the College Application Form. Attach a detailed Resume/CV, with the names and contact details of two referees, a written reference from your Minister of Religion, and a copy of your Working with Children Check and a copy of your Teacher's Registration information. The Principal will contact you by telephone to arrange an interview. All staff at Alkimos Baptist College fulfil the school's commitment to promoting and safeguarding the welfare, wellbeing and safety of children. The College is compliant with relevant child safe legislations and that all staff are required to hold a current WWCC.